In soil, vanadium (V) contamination is commonly concomitant with chromium (Cr) contamination, which poses potential risks to humans, animals, and plants due to the transfer of toxic metals and the increase in their concentrations via the food chain or through direct exposure. 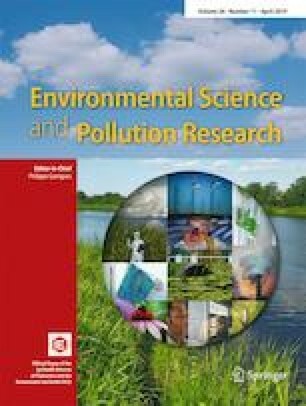 This study applied a multi-step column leaching process using low-molecular-weight organic acids (LMWOAs) to treat V-contaminated soil from a smelter site that contains 2015.1 mg V kg−1 and 1060.3 mg Cr kg−1. After leaching three times with an equivalent solution/soil ratio of 0.3 mL/g using 1.0 M oxalic acid solution, the total removal rates reached 77.2% and 7.2% for V and Cr, respectively, while the removal rates of the extractable fractions reached 118.6% and 99.2% due to the reduction in residual fraction (F4) of toxic metals. Simultaneously, the distribution and redistribution of geochemical fractions of V and Cr were determined with a sequential extraction technique, and the greater proportion of potential mobile fractions of V (65.1%) may increase its leaching from soil relative to Cr (7.1%). In addition, a lower pH of the leaching agent increased the efficiency of the leaching process to an extent. Compared with batch extraction with a typical solution to soil ratio of 10 mL/g, multi-step column leaching used less agent and hence produced less wastewater. This strategy could reduce the mobilization and bioavailability of toxic metals, and potentially enhance in situ soil flushing for the remediation of V- and Cr- contaminated soil. The online version of this article ( https://doi.org/10.1007/s11356-019-04915-7) contains supplementary material, which is available to authorized users. This work was financially supported by the Major Science and Technology Program for Water Pollution Control and Treatment (2017ZX07202005).